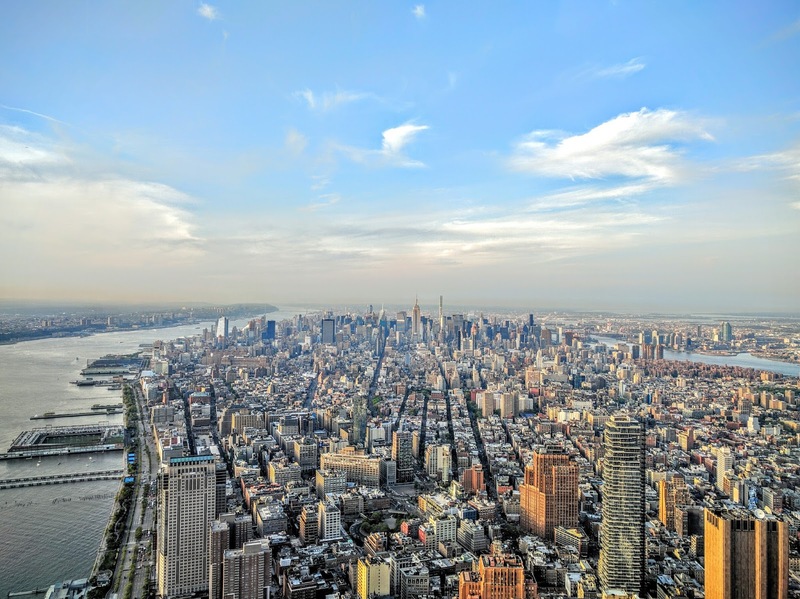 The One World Observatory at One World Trade Center offers visitors spectacular views from the top of the tallest building in the Western Hemisphere and 4th tallest in the world. The total height of the building is symbolic, measuring to an extraordinary height of 1,776 feet broken down into 1,368 feet for the skyscraper and an additional 408 feet for the spire on top. 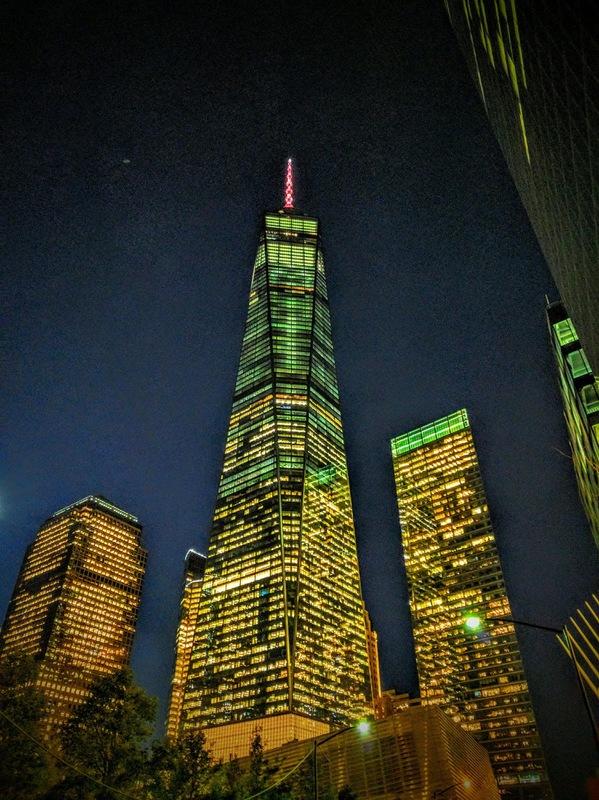 New York City's newest observatory opened on May 29, 2015 and based on our experience here, it is by far one of the best observatory experiences from start to finish. The One World Observatory is not open-air like at the Empire State Building and Top of the Rock, but offers spectacular panoramic 360-degree views of New York City. The whole experience from the Global Welcome Center to the Sky Pod Elevator showcases great technology, making this observatory experience one of a kind. Your experience will begin at the Global Welcome Center, which is an ever-changing video wall, which welcomes you in ten languages and celebrates the homelands of all of the international visitors. You will pass through airport style security screening and if you bought a VIP or Expedited Screening ticket, you can expect lines to be very short. The elevator ride to the top of the One World Observatory is very fast and as you ride to the top, you'll be able to watch over 500 years of New York City evolution via a virtual time-lapse in under 60 seconds. Check out the video below for a demo. 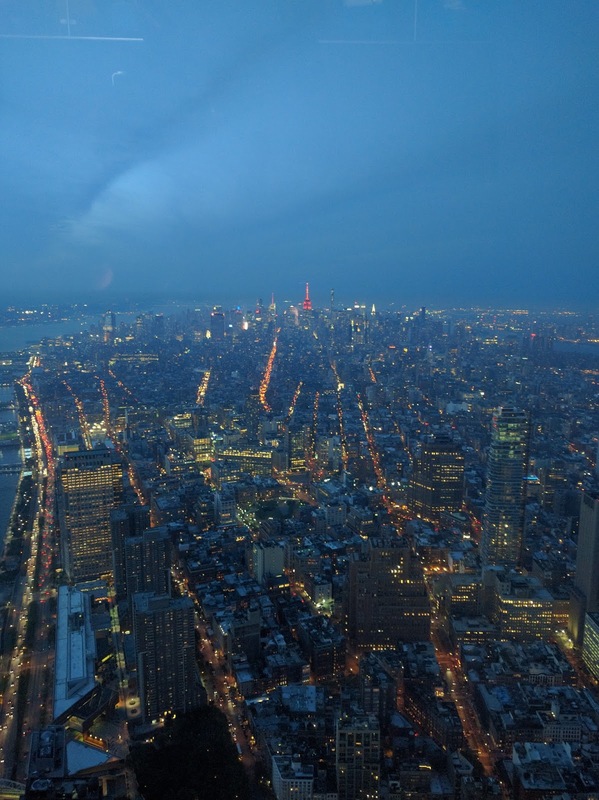 OWO Experience Skypod Elevator from One World Observatory on Vimeo. On the 100th floor you'll be able to take in all of the panoramic views in every direction and discover Manhattan, Brooklyn, New Jersey and the surrounding waters from an entirely new perspective. Also encompassed on the 100th floor is the Sky Portal, City Pulse, Gift Shop and Dining on the 101st floor. The Sky Portal is a clear 14-foot glass disc that gives a glimpse of the view below and mimics what’s happening on the city streets 100 stories below. The City Pulse is an interactive display with official skyline concierges, who bring you deeper into the neighborhoods, history and culture of New York City. You can enhance your experience by renting an interactive tablet that identifies landmarks, zooms in for a closer look and provides in-depth information. If you buy access to the interactive display online for $12, you'll save 20% off regular prices from buying access to it on-site. Lastly you can commemorate your visit with souvenirs and premium keepsakes from the giftshop and also capture your moment at the top of the world with a $30 add-on picture on a green screen, with views of the One World Trade Center Building in the background. The entire visit at One World Observatory should take approximately 45 minutes to an hour and depending on what other attractions you plan on visiting, I'd recommend visiting just before sunset, so you can take in both day and night views of the Manhattan skyline. Hours: Open from 9:00 AM until 8:00 PM, seven days a week. Note that the last tickets up are sold at 7:15 PM. Tickets: There are a variety of different ticket options available with basic ticket prices starting at $34 (Adults), $28 (Kids) and $32 (Seniors). Note that kids 5 and under are free. If you prefer to have more flexibility on when you will be visiting or prefer a weekday, weekend or visiting right before Sunset, ticket prices go up very fast from the basic starting prices. Tickets are only available online at the One World Observatory website or at the ticket box office. Buying online at the website has $3 discounts from buying in person or if you have a Mastercard World Elite credit card, you can buy discounted tickets at the Mastercard Priceless Cities Promotion website, with the specific site for the One World Observatory found here at Mastercard Mondays. Overall from start to finish, the One World Observatory Experience was the best of the three observatories we visited on our trip to New York. 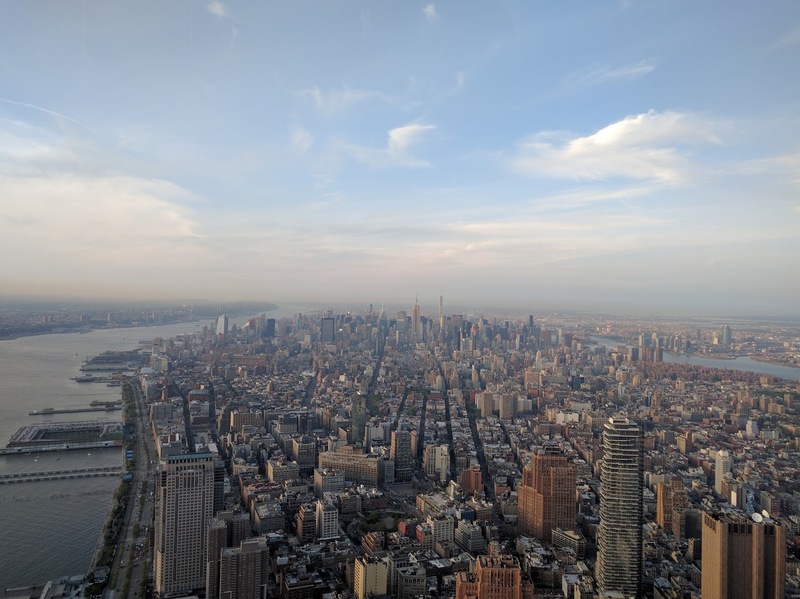 While the Empire State Building and Top of the Rock observatories offer something different, we personally preferred the views and technology experience available at the One World Observatory.